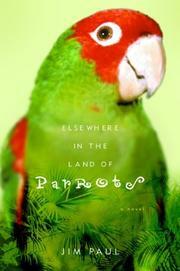 Poet and second-novelist Paul (Medieval in L.A., 1996) depicts two intellectuals who are drawn to Ecuador to discover themselves, each other, and parrots. David Huntington is an X Poet (read Language Poetry, which Paul generously mocks) who has garnished, after a failed marriage, bouts of deconstructionist ennui, and excessive hermitage, the coveted Wadsworth Prize (read MacArthur “genius” award). The problem is, he has no life. He lives with a nefarious parrot his father gave him named Little Wittgenstein, who attacks fellow X Poets and romantic candidates alike, so that David finally shoos him out the window. The bird, though, however unnerving, was his metaphorical Other, and soon David longs for him. Scouring San Francisco, he learns of a flock of parrots congregating near Telegraph Hill. He meets Mike, a bird-lackey of sorts, who convinces David the birds have a purpose for him. Putting poetry on the back burner, he obsessively researches parrots—an indulgent but interesting aside. Meanwhile, Fern, a more fully realized character, has traveled to Ecuador for dissertation research on the habits and evolution of the Aratinga erythrogenys, mangrove swamp parrots known to be “indicators of the state of the earth.” The Aratinga happens to be the same variety fascinating David. Fern takes a job with the local wildlife reservation, a place that has two problems: one, it’s more a zoo than a reservation, and two, it’s pretty much a holding house for exotic animals sold on the black market by el director Qualles. Fern’s fiancé drops her a few days before she locates the elusive parrots, gets fired by Qualles, and is taken in by Peace Corps friends in a nearby fishing village. A few unlikely events leave David homeless and ship-bound for Ecuador, where a mutual acquaintance sets up a meeting between him and Fern. Despite territorial bitterness, the two can’t dismiss the spark between them. Joining forces with two government officers (seriously? ), they go after Qualles. Engaging, lyrical, and funny, but raced to a Book-of-the-Week ending.